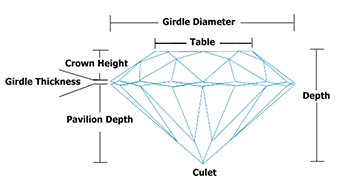 The best ruby cuts offer a depth/width ratio higher than comparable diamond cuts. Expect a depth percentage of 65% to 80% for good quality rubies (the depth percentage is depth/width). Stones that are too deep will look smaller than expected but they will show off more color than they would if they were cut to normal proportions. Deep-cut stones also preserve weight, increasing the cost of the stone without the expected increase in the size of the crown (top portion of the gem). Stones that are too shallow will look big for their weight and appear lighter in color than deeper-cut stones. Good quality rubies also have good symmetry when viewed in profile - reflecting the light evenly. The overall grade is determined by looking at Hue, Tone, Color-Purity, Clarity, Transparency and Cut. The best sapphire cuts offer a depth/width ratio higher than comparable diamond cuts. Expect a depth percentage of 65% to 80% for good quality sapphires (the depth percentage is depth/width). Stones that are too deep will look smaller than expected but they will show off more color than they would if they were cut to normal proportions. Deep-cut stones also preserve weight, increasing the cost of the stone without the expected increase in the size of the crown (top portion of the gem). Stones that are too shallow will look big for their weight and appear lighter in color than deeper-cut stones. Good quality sapphires also have good symmetry when viewed in profile - reflecting the light evenly.